CAN sells a small range of cycling-related gear, designed to help kit you out for cycling in NZ (or elsewhere). All quoted prices include GST to make it simpler for you. When you buy from CAN, you are directly supporting CAN advocacy activities. Your payment goes towards advocacy, and only a very small proportion to administration. Some items are deliberately lower in price to make them easy for to you to get, while others are at a premium so you can show your support for CAN with pride! T shirt with the Cycling Action Network chainwheel logo on the front and "More People on bikes" message on the back. Please select size and remember to add your "Home Address" to the order! 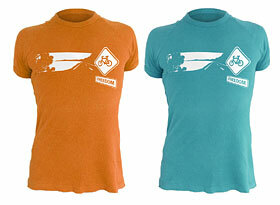 Help promote cycling and CAN by wearing the CAN 'Freedom' t-shirt. Please select size/colour and remember to add your "Home Address" to the order! The t-shirt features a 'Freedom' road sign, a coastal image, and a CAN logo on the sleeve.. Female sizes from 8 to 14. Youth sizes: Youth L (YL) and Youth XL (YXL). Email us with your postal address and how many you want. Download the order form at the bottom of this page, print and fill it out, and post it to us with a cheque to CAN, PO Box 25-424, Wellington 6146. Cycling Advocates Network, Kiwibank 38-9005-0922435-01, and email us with both your payment details (important!) and the details of what you want to order. The prices above include postage within New Zealand. For orders from outside New Zealand, please email us first for a quote on shipping costs. For a larger order and to combine shipping costs, please email us for the Total Amount. We then can give you payment options. If the PayPal system asks you to 'retry', check in your web browser configuration that you have 'cookies' enabled. PayPal requires this, but some browsers have them turned off by default.